Mice & Mystics (Plaid Hat Games)—Miniatures game, played with 2 and 3 people. Sentinel Tactics (Greater Than Games)—Miniatures game, played with 2 and 3 people. Galactic Strike Force (Greater Than Games)—Board game, played with 3 people. Pathfinder Adventure Card Game (Paizo Publishing)—Card game, played with 3 people. Sentinels of the Multiverse (Greater Than Games)—Card game, played with 2 and 3 people. Mouse Guard RPG (Archaia Studios)—Role-playing game, played with 4 people. Hobbit Tales from the Green Dragon Inn (Cubicle 7)—Card game/story game, played with 2 people. Race to Adventure! (Evil Hat Productions)—Board game, played with 2 and 3 people. Bulldogs! (Galileo Games)—Role-playing game, played with 6 people. Savage Worlds: Space (Pinnacle Entertainment/Chaosmeister)—Role-playing game, played with 7 people. DramaSystem (Pelgrane Press)—Role-playing game, played with 7 people. The Quiet Year (Buried Without Ceremony)—Story game, played with 2 people. Durance (Bully Pulpit Games)—Story game, played with 5 people. Monster of the Week (Evil Hat Productions/Generic Games)—Role-playing game, played with 4 people. The One Ring (Cubicle 7)—Role-playing game, played with 3 and 6 people. Cold City (Contested Ground Studios)—Role-playing game, played with 3 people. Night Witches (Bully Pulpit Games)—Role-playing game, played with 4, 5 and 6 people. Fate of the Mouse Guard (playtest): that’s the setting from Mouse Guard with the rules from War of Ashes: Fate of Agaptus!—Role-playing game, played with 6 people. Castle Panic (Fireside Games)—Board game, played with 6 people. Slash (Games by Play Date)—Card game, played with 6 people. Star Wars: Imperial Assault (Fantasy Flight Games)—Miniatures game, played with 3 people. Monsterhearts (Buried Without Ceremony)—Role-playing game, played with 5 people. We played using Joe Beason‘s Elderhearts hack. Kaiju Inc. (Evil Hat Productions)—Card game, played with 4 people (playtest). Shadow of the Century (Evil Hat Productions) (playtest)—Role-playing game, played with 5 people. Apocalypse World (Lumpley Games)—Role-playing game, played with 5 people. We used Karen Twelves’ “Olive Garden” playset. Kigi (Smart Play Games)—Card game, played with 2, 3 and 4 people. 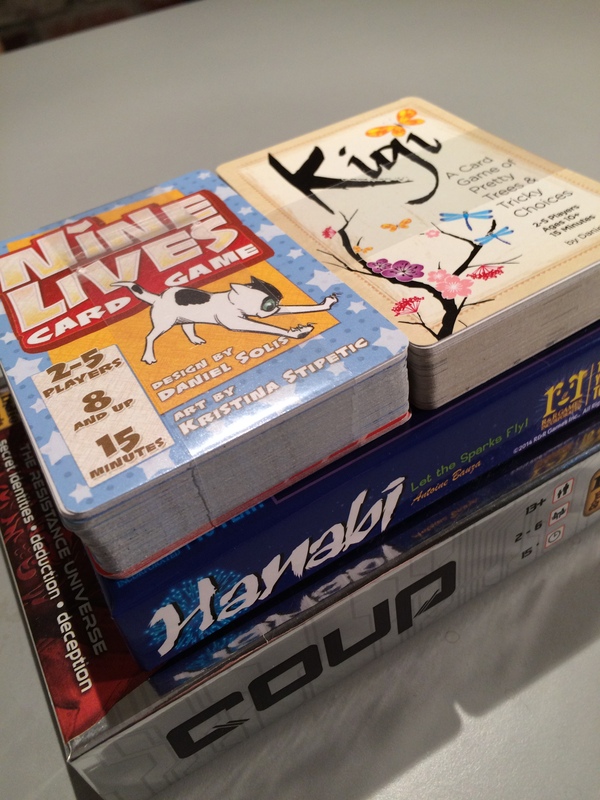 Nine Lives (Smart Play Games)—Card game, played with 2, 3 and 4 people. Coup (Indie Boards and Cards)—Card game, played with 2 and 5 people. Hanabi (R&R Games)—Card game, played with 2 people. Star Wars X-Wing Miniatures Game (Fantasy Flight Games)—Miniatures game, played with 3 people. Golden Sky Stories (Star Line Publishing)—Role-playing game, played with 4 people. Epic Spell Wars of the Battle Wizards: Duel at Mt. Skullzfyre (Cryptozoic Entertainment)—Card game, played with 3 people. Fiasco (Bully Pulpit Games)—Story game, played with 6 people. Forbidden Desert (Gamewright)—Board game, played with 3 people. Motobushido (Alliterated Games)—Role-playing game, played with 7 people. War of Ashes: Fate of Agaptus (Evil Hat Productions)—Role-playing game, played with 4, 5, 6 and 7 people. Monster Draft (playtest)—Story game, played with 4 people. Robot Rally (Wizards of the Coast)—Miniatures game, played with 5 people. OmegaZone (Brooklyn Indie Games)—Role-playing game, played with 6 people. Just Sentinels (PbtA/Just Heroes hack by Alan Hodges)—Role-playing game, played with 3 people. Mass Effect (PbtA hack by Alan Hodges)—Role-playing game, played with 6 people. XCOM: The Board Game (Fantasy Flight Games)—Board game, played with 2 people. Star Trek: Five Year Mission (Mayfair Games)—Board game, played with 3 people. Big Bad Gauntlet (playtest)—Role-playing game, played with 15 people. Bluebeard’s Bride (Magpie Games) (playtest)—Story game, played with 5 people. Fate Accelerated (Evil Hat Productions)—Role-playing game, played with 5 people. Marvel Heroic Roleplaying (Margaret Weis Productions—Role-playing game, played with 6 people. Mint Tin Pirates (subQuark publishing)—Card game, played with 2 people. Mint Tin Aliens (subQuark publishing)—Card game, played with 2 people. Koi Pond (Smart Play Games)—Card game, played with 2 people. JUGGERNAUT (Bully Pulpit Games)—Live action role-playing game, played with 5 people. Don’t Turn Your Back (Evil Hat Productions)—Board game, played with 2 people. Nephews of Dune (playtest)—Role-playing game, played with 5 people. Augustus (Hurrican Games)—Board game, played with 4 people. Dresden Files Accelerated Edition (Evil Hat Productions) (playtest)—Role-playing game, played with 2 people. Mint Tin Mini Apocalypse (subQuark publishing)— Miniatures game, played with 2 players. Helionox (Zeroic Games)— Card game, played with 2 people. The Company (Evil Hat Productions) (playtest)—Role-playing game, played with 4 people. Dungeon World (Sage Kobold Productions)—Role-playing game, played with 5 people. Samurai Spirit (Fun Forge)—Board game, played with 2 and 3 people. Imperial Settlers (Portal Games)—Board game, played with 3 people. The Grizzled (Sweet November Games/Cool Mini or Not)— Card game, played with 2 people. 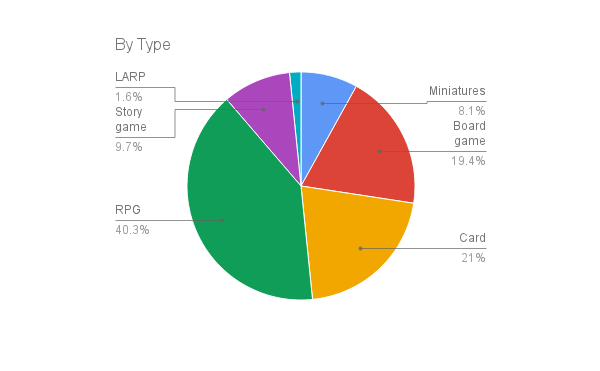 Posted on January 2, 2016 February 5, 2016 by mechanteanemonePosted in friends, gamesTagged 51in15, board games, card games, friends, games, miniatures games, rpgs, tabletop.